This perennial favourite collection of basin taps and bath shower mixers capture the aura of a bygone time. The traditional tap and mixer collection is the perfect partner to the traditional showers range. Q. Are these taps guaranteed and if so for how long? Hello, these taps have a 10 year guarantee. Q. Should white hot-cold discs be loose? Hi, they will be slightly loose so you can remove them to get to the screw so you can change the cartridge. If you're not happy please contact our customer service team with your order number and we will look into it further. Thanks! Q. 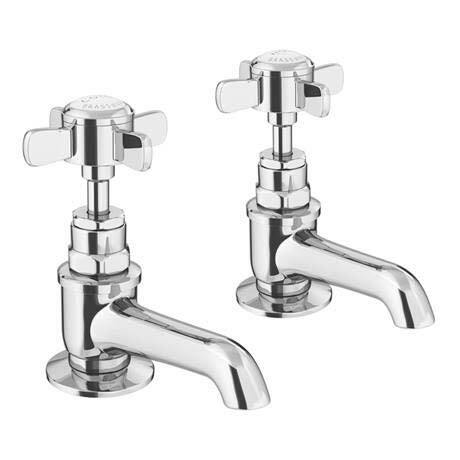 Do these taps have quarter-turn ceramic valves? Hi, this does not have ceramic discs just traditional cartridge's. Hope this helps, thanks. Good looking traditional basin taps. Nice taps which look good in our old basin. "Good taps, great price, quick delivery." Product is as per site. Looks good. Brought to update our downstairs hand basin after having gold effect for the last 20 years. The longer nose taps are an excellent feature especially when grandchildren visit, the water now goes into the sink and not the floor. We are so pleased we purchased these. We needed to replace a set which I had managed to damage trying to remove years of limescale. These were an almost the same as the originals except they came out slightly longer into the sink which actually works and looks much better. The price was great and the build quality is good the only gripe is that the nut at the bottom to attach to the sink is plastic, I'm sure you could replace this if you prefer though. We received the taps just a couple of days after ordering and will definitely be back soon as we have other taps to change now. Spruced up the cloakroom a treat.